When is India's Independence Day? When did India gain Independence from the British? What day or days are given off for this holiday? If it falls on a working day, only that particular working day is given off. It is true that some offices in India have a 6-day work week, working some Saturdays of the month. Where I live in Kochi, the second Saturday of every month is given as an off day. This may not be the case for every area in India, however. What happens if Independence Day falls on a day that is typically given as a weekend day (Saturday or Sunday)? When Independence Day falls on a day that is already an 'off day', no additional, alternative holidays are given as is often the case in the US. Do Indians take off days before or after Independence Day to have a long weekend? As there are so many holidays in the Indian calendar, this is not typically practiced. Among some groups who like to go "out of station" on holidays, they may be more apt to take off extra days for this activity. What do Indians do on Independence Day? While some select areas may have fireworks displays akin to the kinds in the US, it's not so common or expansive. Individuals may have small fireworks they set off around their neighborhood. Take note that unlike the US Independence Day, India's Independence Day falls during the school year. This also restricts the movements of families for vacations and out of town outings. If the kids celebrate Independence Day in their schools, part of their celebrations may include a flag hoist, singing of the national anthem, and a cultural program including re-enactments of the freedom struggle, a fancy dress (costume) competition where the kids dress up in costumes depicting historical or popular Indian figures, and other related events. What are the Indian national colors? 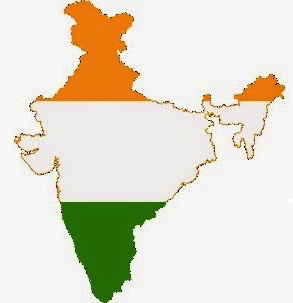 The Indian national flag (right), is comprised of green, white, and saffron (an orange-like color). These three colors are popularly worn by some on Independence Day. Wearing these colors, however, is not so popular as wearing red, white and blue is in the USA. The symbol in the middle of the flag is called the Ashoka Chakra. What is the Indian National Anthem? The Indian National Anthem is called Jana Mana Gana. Feel free to listen to it below. What are some basic facts about India? The prime minister of India is Narendra Modi. The national animal of India is the tiger. The national flower of India is the lotus. As Indian communities across the US celebrate Independence Day, some with large, public outdoor cultural programs (such as my friends in Corning, New York, where we can sometimes see the public participating in open air dandia and other Indian dances). Now, if your US colleagues invite you for these celebrations, you will have a little context to what is going on! Feel free to share more of your experience celebrating this Indian holiday below. Learn to say basic facts of India in an American accent!